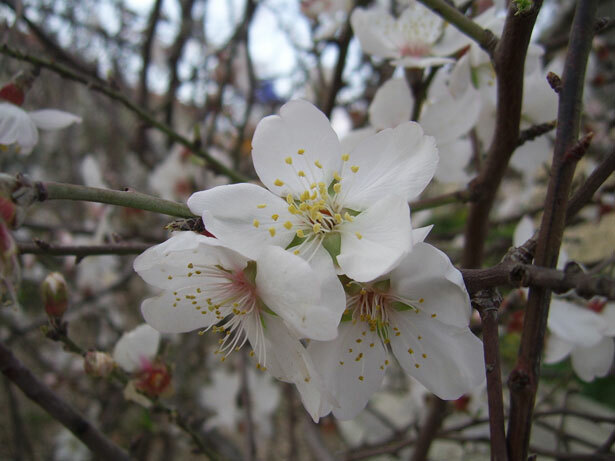 Almond blossoms are the first sign that the winter is near its end. In the United States the groundhog is used to predict the end of the winter. I may have it wrong but apparently if the groundhog comes out of his burrow and can see his shadow then winter will lasts for another six weeks. 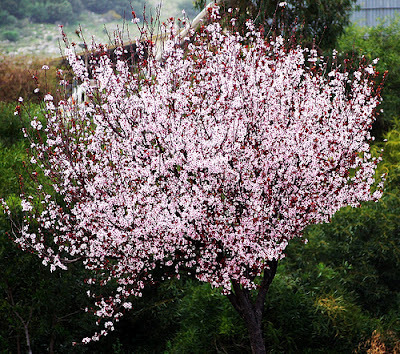 In Israel the almond trees tell us that winter is drawing to an end. They are the first trees to blossom and brighten up the landscape with unexpected dots of pink and white. It is almost as if the landscape are draped randomly with large swathes of lace. These beautiful trees seem to 'appear' during the end of January/ beginning of February. The rest of the year the almond trees blend in the landscape and one hardly notices these trees. The almond blossoms not only remind us that the winter is coming to an end but also that Tu b'Shevat ( the trees' New Year) will soon be celebrated. It is now already nearly the end of February -Tu b'Shevat has come and gone, the spring flowers have started to appear and soon all the almond blossoms will be gone. I just had to write a post about the amazing almond blossoms though. I have come to love these beautiful trees and even though I expect them, they always surprise me with their beauty.